The New Jersey Mission of Honor is a registered 501 (c)19 Non- profit Corporation. 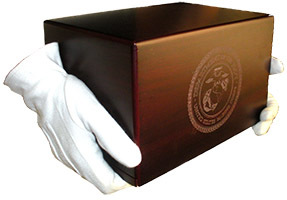 Our mission is to locate, identify and inter the unclaimed cremains of American Veterans. With just a $300.00 donation we would be able to purchase an urn to honorably inter these war veterans. The corresponding military branch of the service will be laser engraved on each urn for each veteran cremain that the Mission inters.